It’s the first day of the spring season, which means Derby season is just around the corner. All of the Derby Festival events are gearing up for another year of fantastic family fun with festivals, races, and of course, Thunder Over Louisville to kick it off. If you’ve lived in the Louisville or Southern Indiana areas for a while you probably already know where you might watch the firework show. However, if you are looking for a new place to watch this year, we’ve put together a list of some of the best places to view the show in Louisville and Southern Indiana. The Galt House: If you’re looking to splurge a little to have one of the best seats in the house, grab a room at the Galt House Hotel. During Saturday’s events you will be able to view the air show and the firework show from the comforts of your own hotel room. With the purchase of a room you will receive access to parking and the pool deck viewing area. 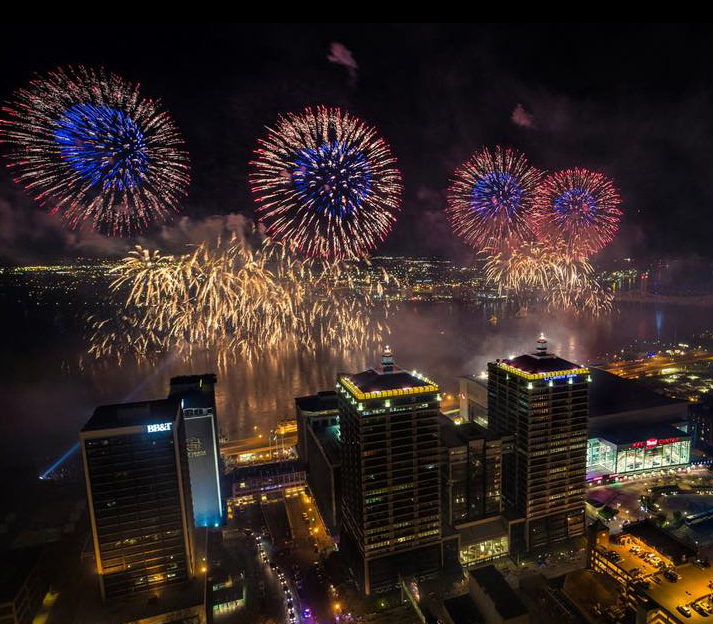 Belle of Louisville: To experience a great view of the fireworks and explore the Belle of Louisville, grab a reservation for the Belle of Louisville Dockside viewing party. On Saturday, they will host an all-day event with a buffet, cash bar, and concessions. Thunder at the Center: The Kentucky Center for the Arts will host an all day event and viewing party at 501 W. Main Street. The event will feature activities for kids, food, and a cash bar. 11th Annual Thunder at the Bristol: Bristol Bar & Grille in Jeffersonville will be hosting their annual viewing party starting at 3pm on Saturday. You’ll need to snag tickets for this event, but you will have access to one of the best views of the show as well as a food buffet and drinks. Spirit of Jefferson: The Spirit of Jefferson will be hosting a dockside viewing party starting at 3pm. This event will feature hors d’oeuvres in the afternoon followed by dinner, all before a great view of the fireworks. Rocky’s Thunder Party: Rocky’s in Jeffersonville will be hosting a viewing party from 2-10pm on Saturday. This event will feature a beer garden for adults, as well as plenty of activities for the kids. You will also get to enjoy appetizers and a dinner buffet. If you’re looking to stick to a budget this year, there are also a ton of options for viewing along the waterfront in Louisville and in Southern Indiana. Where will you be watching the fireworks this year? Let us know in the comments below.